With September upon us, MLB rosters can be expanded anywhere up to 40 players. As the Yankees continue to battle for a playoff spot, the team announced six call-ups today prior to their pivotal series with the Baltimore Orioles – four pitchers and two position players. Expect more names to get the call as the month progresses. Severino is expected to slide into the bullpen where he’s had success this season. He was scratched from his start the other night in Scranton, and ended up pitching 2.1 effective innings out of the bullpen that night in preparation for his role with the big league club. 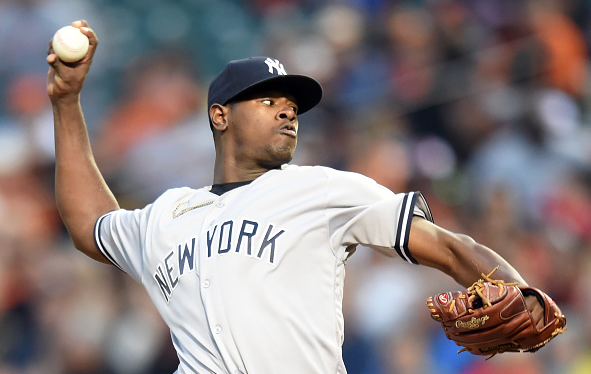 The Yankees still believe that Severino can be a useful starter in the future, but right now, he’ll be another arm for Joe Girardi to turn to in relief. Yankee fans have seen plenty of Yates this year, who’s had some good moments and bad moments out of the pen. He was sent down earlier this week because the Yankees needed a fresh arm against the Royals, but he’s back now to provide additional bullpen depth. Yates is 2-1 with a 5.40 ERA with 44 strikeouts in 35 innings this year. This move comes as a surprise. GM Brian Cashman said he wrestled with the idea of calling up the 23-year-old righty, and ultimately decided that Holder deserved a shot at the big league level. Just last week, Holder made headlines by striking out 11 straight batters in relief. He’s arguably the best reliever in the Yankees’ minor league system, evidenced by his 35 strikeouts in 20 innings and minuscule 0.89 ERA in 12 games this year for Scranton. The Yankees obviously think high of him since they’re placing him on the 40-man roster. Similar to Yates, Goody has been a familiar face in the Bronx this year. He’ll slide into the pen as a depth option for Girardi. Goody has had good numbers in the minor leagues and has had decent stretches in the majors, but he’s struggled with consistency. He has a 4.23 ERA in 27.2 innings in the Bronx in 2016. Much to the delight of Yankee fans, Refsnyder is back in the Bronx after being sent down three weeks ago because of a numbers crunch with the roster. All Refsnyder has done since being optioned is hit, which is essentially what he’s done his entire career; the problem has been finding a position for him. Ref has played a lot of third base with the Railriders, along with outfield and second base. He commented recently that the only way he can stick with the Yankees is by becoming a super-utility-Ben-Zobrist-type. With Aaron Hicks going down with an injury, expect to see Refsnyder used at three positions to give Girardi some flexibility. Regardless, he’ll be a nice right-handed bat off the bench late in games if need be. It seems as if every year, the Yankees – and most major league teams for that matter – have that one September call-up that’s strictly used as a pinch-runner. Last year it was Rico Noel. In 2014, it was Antoan Richardson. This year, it’ll be the veteran Young, who was just acquired from the Brewers following the Ben Gamel/Seattle trade. Young can also play some outfield.